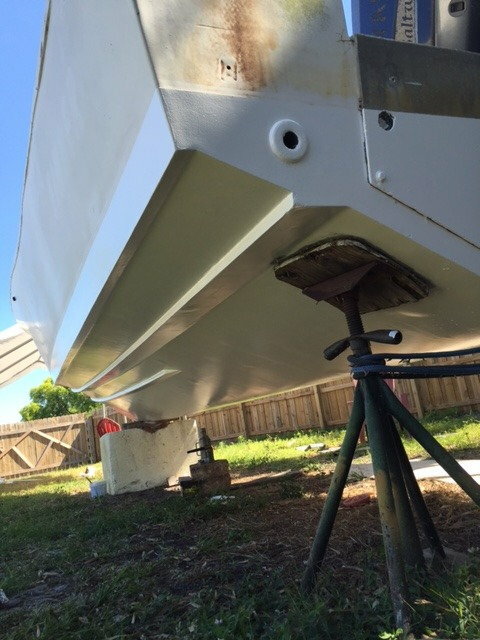 Hey guys, wanted to strip the bottom paint off my boat, but have realized it was put on well and will not come off without a fight. Now I am considering having it stripped using something like Farrow System and repainting it with Interlux VC. The boat will be kept on a lift. Did you have to put anything underneath it? Current bottom is clean, but is going to be tough to get off. The grey is the epoxy barrier coat showing thru. Bottom paint looks clean and in good condition. Might consider painting with white bottom paint since the main improvement it seems like you will get is cosmetic. It won't look as good as VC, but there some aesthetic value to the multiple $$boat units that will stay in your wallet. I put VC performance on my boat, has not hit the water. I sprayed 2 or 3 coats can't remember. Nice to work with, easy paint application, particularly because there's no pressure to have a perfect finish. I put Alexseal epoxy primers underneath, but it's a new build so you should follow interluxs' technical data sheet for primers. The paint as sprayed results in a semigloss finish that is fine. I chose to burnish the finish to more gloss like shine. It looks very nice. That is a thought, do you think could you paint something like Petit Vivid White right over that? 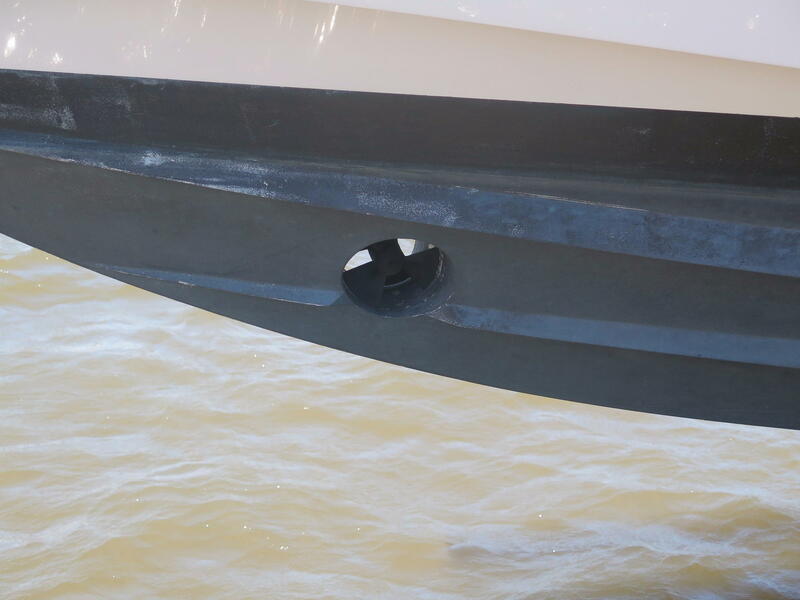 ​​​​​​​So this is being painted on a new hull? I put on my 377 as well, had the old bottom paint soda blasted and then they just rolled it, came out nice and I gained a bit on MPG....I recommend it. Did you have to fair (sand and patch) the bottom after soda blasting? Do you remember who did it? Steve at blackpoint marina did it, I think they just painted it after the soda blasting...I don't think they sanded but I could be wrong.. So this is being painted on a new hull? Wow, that is some impressive work. Beautiful boat. Did you guys that rolled it on tip it? Also, did you use any thinner? 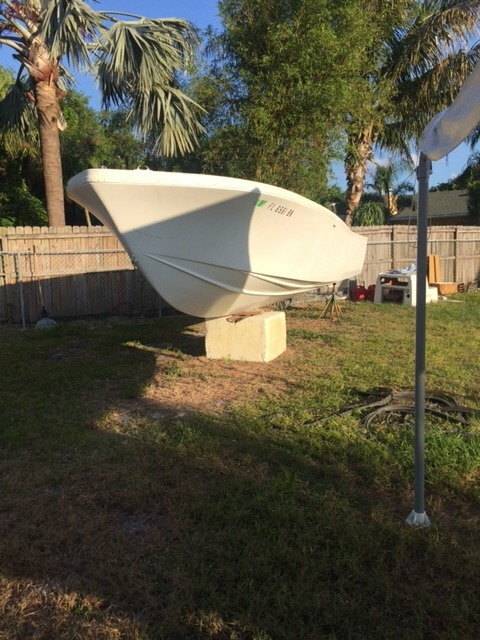 Getting ready to put this stuff on too and any info helps. 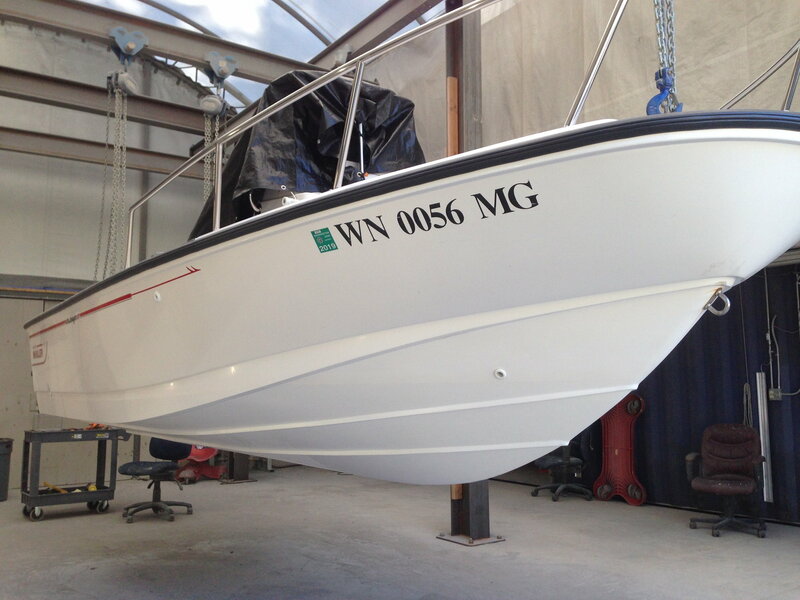 I stripped several layers of old bottom paint off of this Whaler with conventional dry sandblast (low pressure/fine media) and filled old holes and gouges with 3M polyester marine fairing compound. Rolled the Performance epoxy on without tipping but thinned it a bit with 2316N Interlux solvent to eliminate roller tracks, three coats. Cured with minor orange peel texture which tipping likely could have prevented. It does not seem to be realistic to use a chemical stripper, but I do not want to have to refair the entire bottom if I use a sandblasting. They recommend sanding to 80 grit prior to application so i dont think you would be far off after media blast. Im getting ready to this as well and am curious as to how long guys are waiting between coats.
. . . but I do not want to have to refair the entire bottom if I use a sandblasting. Low pressure sandblasting (approx 40 psi) and very fine media (typically crushed bottle glass) will effectively remove old bottom paint without eroding gel coat if performed by an experienced hand using professional equipment. The instructions say 24 hours. But I think I did like 12 hours and 3 coats. I painted in the middle of summer so it dried quick. They also say you may need to sand after but I didn't have to, has a slight orange peel texture but they say that helps performance. I did 3 coats on mine (rolled), waited about 12 hours between coats (also did it during summer), no primer just sanded off the old bottom paint. I thinned the last coat a little extra with the correct thinner as noted above and it came out with a nice semi gloss sheen. That was about 2 years ago and it still is holding up strong, any parts that sit in direct sunlight do get a little chalky though but not bad. My boat is old as hell also just fyi. Thanks guys! I have a plan. I am a couple weeks out, but will post some before and after on the thread when I am done.